Sew Karen-ly Created...: Island Batik's Great Outdoors Blog Hop! 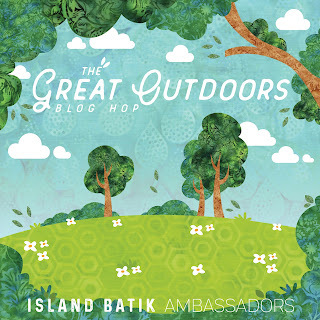 Island Batik's Great Outdoors Blog Hop! As an Island Batik Ambassador, I will be taking part this month in a blog hop entitled "The Great Outdoors", and it all kicks off today! I hope that you will join us in this fun event where we share all kinds of creative ideas of what to do with the new batik collections hitting store shelves soon. Island Batik has a great giveaway you can enter here. The Ambassadors also have individual give-aways on their blogs, so make sure you visit all the links below to enter. My day to post is Thursday, August 9, so be sure to check back then. So - head first to Island Batik, and then on to Yellow Cat Quilts and Creative Blond. The Great Outdoors Blog Hop!